GOOD MORNING & welcome to another "Scrapping the little things"! I hope you ALL had a GREAT weekend! 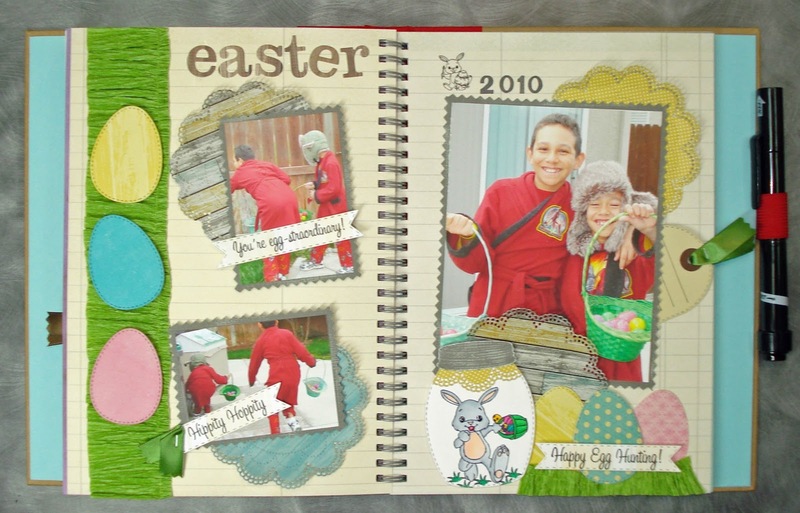 Well, today I was happy to do a few pages in my smashbook! If I haven't mentioned before, I absolutely LOVE my smashbook because there are simply "NO RULES"! 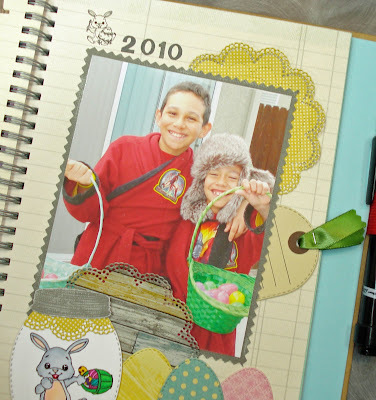 You can make these pages as simple OR more detail AND you can basically smashbook ANYTHING! When I first got my smashbook, I really wanted to document the little things that mean the MOST to me. I know, you are probably saying, "Why is she showing old Easter 2010 pics?" Why, it's because I just LOVE that my boys also appreciate the "little things" in life, just like their Mommy & Daddy! We can do something as simple as cook an AWESOME meal & watch a movie & at the end of the night, they say "That was FUN Mommy"! I just HAD to smashbook these pictures because.....I just HAD to! 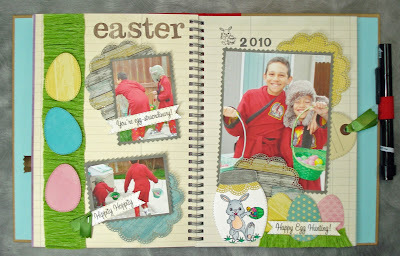 ;) This particular year "2010", Easter ALMOST didn't happen because the "Easter Bunny" was SOOOO SICK! :( I remember I was in bed w/a fever & I had told the boys, "I heard the Easter Bunny was sick too!" & they said, "It's okay Mommy, the Easter Bunny has a BIG job & I am sure all the kids will forgive him if he doesn't visit any houses tonight!" OKAY, now how can you NOT come alive and do something, because that right there... was simply "priceless"! When the boys woke up Easter morning, they peeked in the backyard really slow & started yelling "Mommy, Daddy, the Easter Bunny DID come, poor guy, I hope he doesn't get more sick!"! Let's just say that I had 2 of the HAPPIEST boys on Easter morning! Just seeing those BEAUTIFUL smiles on their ADORABLE faces simple made my heart HAPPY! 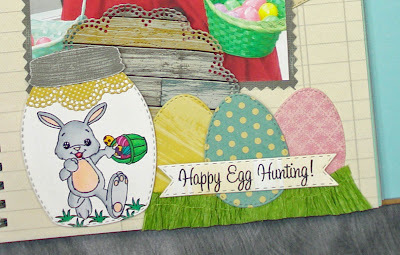 As you can see, I used more doilies and that cute tiny bunny coloring his Easter egg is also from "Happy Hunting"! I used the number stamps from "Follow Your Dreams". I tuck my cute little tag from "Just Tags" & stamped the little bunny from "Hello Spring" & drew lines on there myself for journaling. Then I just staple some green ribbon to it! Isn't it the CUTEST journaling card ever? hehehe! I love it! 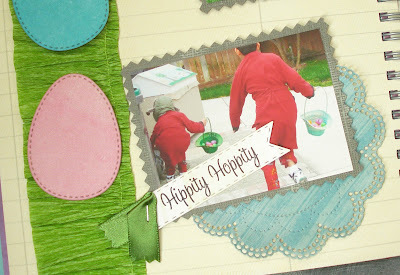 For today, my design team & I were all to use our new "Jar Dies" somewhere on our pages! I decided to stamp that bunny from "Happy Hunting" and add a piece of the doily to it to give it a different look & I LOVE how it turned out! I just glued the doily exactly where I wanted it, then cut off the excess. Again, the egg dies are from "Hello Spring" & the sentiment is from "Happy Hunting"! Now onto my FABULOUS design team. Don't forget to visit their blogs & leave them some L-O-V-E! I hope you were ALL inspired to scrap something today! Don't forget we also have a NEW "FUN" challenge going on HERE! I hope to see lots of you playing along~! Great pages everyone!! I LOVE the doily as the material on the jar Miss Emma!! Can't wait to receive my happy mail!! Cute projects everyone. 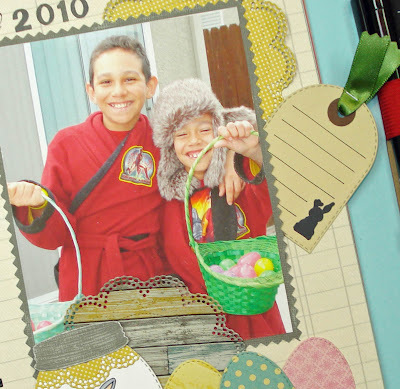 Emma, your boys are so cute and I love how you added the doily to the jar, love that journaling tag. Good morning! So many cute ideas with the canning jar and the doily! Emma love your pages truly loved your story takes me back just so so precious memories to capture and scrap. You have such a sweet family may God always bless you!! Thank for more great ideas with the doily and canning jars. Oh my goodness....amazing project by the DT! So many fun idea's and great inspiration! Emma, your pages are awosome! I LOVE all the F*U*N photo's, embellishments and pull out tags! Love the jar use idea. Love the lowercase dies. 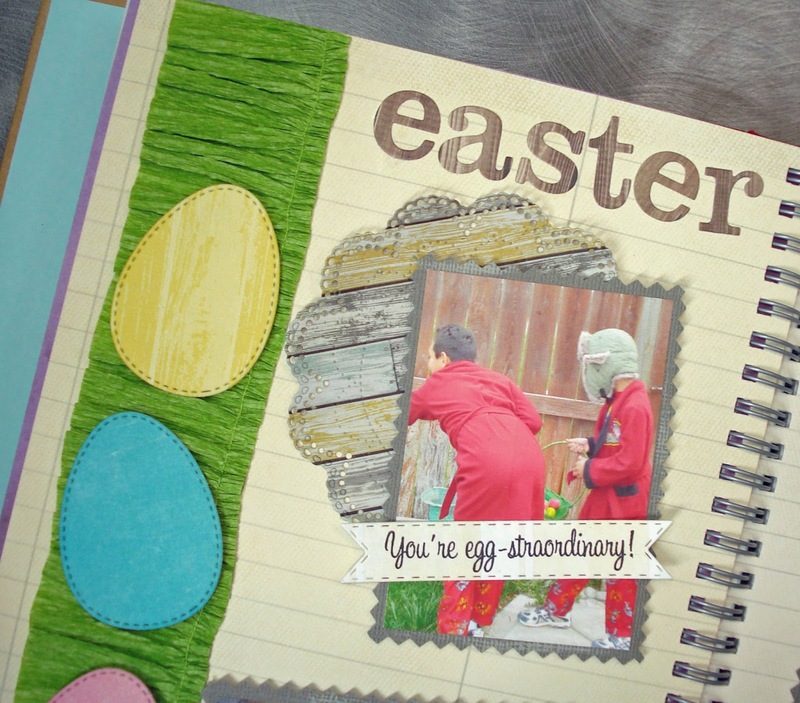 What a fun memory and glad you scraped up the energy to hide the eggs and make an Easter memory for the boys :D I love that your jars hold many things. Everyone did a fabulous job. Emma ~ Oh look at these Smash Book pages!! I just LOVE that doily die but using the fence paper ~ so FITTING for Easter! All the details are so PERFECT ~ ALL of them! I am jusat AMAZED that with in 3 years how much your boys have grown~ WOW! Such CUTIES!! Thank goodness the Easter Bunny found strength to get his job done! Everyone did such an AMAZING job again!